Susie Minto of the Forres A96 Community Group. The dualling of the road is a huge project for the entire region but some feel they have been airbrushed out of the consultation process by the Scottish Government. The Forres Area A96 Dualling Action Group also believes the decision making process is progressing with undue haste, meaning that it may not best suit the town and surrounding area. It wants to introduce a “co-creative process” that will give the community more say when it comes to finalising the best route. That would see local people hold lengthy discussions with representatives from Transport Scotland to talk about the best way forward for the proposals. Such a process has been used in connection with some of the soon-to-be-dualled sections of the A9 but appears not to be considered suitable for the A96. After numerous requests and much correspondence with the Scottish Government, the action group feels locals have been “fobbed off” and are receiving “cut and paste” answers. The public consultation about the prospective A96 dualling routes between Hardmuir and Fochabers closed on Friday and Transport Scotland plans to make a final decision by the end of the year. 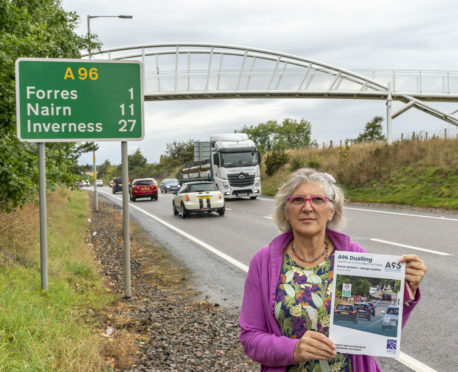 Susie Minto, a member of the group, believes the process must be delayed that the local communities affected by the A96 routes need to have a greater say. She said: “Through a co-creative process, we want to engage with Transport Scotland and slow down their process in order to talk about the best way forward with the people on the ground. “Everyone should be working together to find the best case scenario for the route and the best way to do that is through community engagement. “Local people have more knowledge about these things than designers and architects and they have a way of finding out what suits the needs of people better. The co-creative process at Dunkeld and Birnam, near Perth, saw the local community there work in partnership with Transport Scotland to come up for the best route for the dual carriageway between Pass of Birnam and the Tay Crossing. They worked together and a final public vote decided what route would be selected in the end. Ms Minto thinks that the government should work to empower local people by working alongside them to make such an important decision. She said: “This might be a definitive moment in the history of Forres, so the people here need to feel empowered and their opinions invited on board. “The A96 dual road will be huge for the area and we need to have a proper say before its too late. With the A96 public consultation finishing last Friday, other Moray community groups have submitted their suggestions on preferred route options. Innes Community Council chose the southern route around Forres and Elgin in the belief that, with the proposed upgrade of the military base at Kinloss, it would give better access to the A940 and reduce the risk of further congestion within Forres, especially from LGV’s. A Transport Scotland spokesman said a co-creative process for the A96 would be “challenging,” but said it would keep the matter “under review”. He said: “The co-creative process on the A9 began earlier this year and therefore it is too early to assess how it benefits the usual route options assessment process.